I visited the Tuli Trail in Botswana in October 2018 and you can read my blog here. The Tuli Block really is a hidden Botswanan gem and so very different to the Okavango Delta. I think that this makes the Tuli Trail a perfect destination for riders who have already ridden in other areas of Botswana or for those, like myself, who are new to the safari way of life. The game viewing in this area is fantastic, with the Mashatu Game Reserve being famous for its large family herds of Elephant. It’s a wonderful experience being able to see these gentle giants in such numbers from horseback. As well as numerous elephants, there is plenty of other game to view. Giraffe, zebra and other plains game can usually be found in large numbers from horseback and during my visit we came across a nursery herd of 26 giraffe of varying ages. If you’re lucky you may even spot lion, hyena and maybe even leopard and cheetah although these big cats are highly elusive. You are led on your adventure by wonderfully knowledgeable guides. After working at Limpopo Horse Safaris for many years your guides are full of stories. What they don’t know about the area, horses or game really isn’t worth knowing. Working alongside your guides are the wonderful kitchen crew who never let you go hungry; do not fear you will eat incredibly well on this safari. At Limpopo, the horses are a real pleasure to ride, they’re incredibly fit, brave and well-schooled. All are ridden in trail saddles and mostly in snaffle bridles. You are riding in an area of dangerous game and so as a rider you do need to be experienced and enjoy the trill of adventure. Each day you will spend up to eight hours in the saddle and so being fit and able to keep up with the group is essential. Throughout the Tuli Trail you stay in four wilderness camps. At two of these you stay in canvas tents with everything you could need and at one you’re in cabins. Two nights are spent sleeping under the stars at Kjotla Camp which is an open air camp. Some camps have flush loos and running water showers and others have long drop loos and bucket showers. This gives a feeling of getting back to basics and really adds to the experience of being on safari in Botswana. 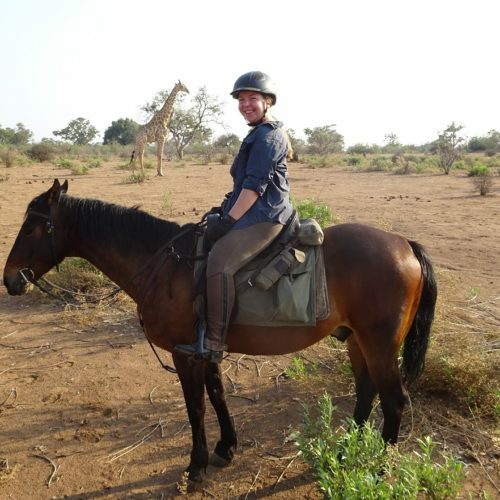 The Tuli Trail is a wonderful horse safari and has given me some incredible memories that will last a lifetime. If you want to see large numbers of game, ride wonderful horses and be surrounded by knowledgeable guides then this is the safari for you.